Aros Building & Design Inc specializes in General Contracting work in the Tucson area. We are not a track home builder, Lara Custom Builders is a Tucson Custom Home Builder for the price of a Track Home Builder. How do we do this? We are a small company without the overhead, share holders, and red tape. Lara Custom Builders in Tucson can customize your home because all information, change request, special request, and custom home design request go through one person-(Eric Lara-Owner). Let’s face it, this is your biggest investment. This investment should not be shared with neighbors 5 feet away on either side. Lara Custom Homes has numerous real estate Agencies on stand by to pick the perfect piece of property for your custom house that you will call home. We know the importance of timely and quality new home construction. Give us a call today at (520) 820-7144 to realize your possibilities. We look forward to hearing from you! Traditions are built over time, and the tradition of building excellence in the desert is a hallmark for Armstrong Homes since the early 1990’s. We are not a track home builder that is interested in quickly turning out the latest cookie cutter home on a postage stamp lot. We may only build a few homes each year. Our reputation though has been established on paying attention to the details that matter most to customers that want an experience worth their investment of time and money. Whether its building your dream home or remolding a high-end home that needs updating to the latest decade, you can rely on our experience and dedication to the crafts and professionalism you expect. Tucson Artisan Builders was created to apply premier custom building principles to new urbanist, sustainable, and infill neighborhoods. Our homes marry state-of-the-art custom home quality with timeless character inspired by the Southwest climate and Tucson architectural traditions invigorated for the 21st century. Dante Archangeli, Tucson Artisan Builders' founder, previously co-founded Milestone Homes. Milestone was a three-time winner of SAHBA’s Custom Builder of the Year award, a recipient of a Sonoran Institute’s first-year Building from the Best of Tucson award, and was featured in numerous magazine and newspaper articles. At Gerlach Construction & Design LLC, we make it our mission to transform your house into your dream home. From the simple to the lavish, we've experienced it all and we can help you every step of the way. No job is too small or too big for us. 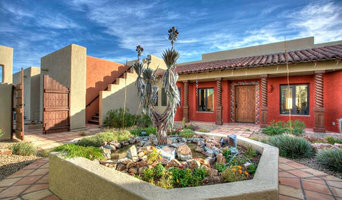 Hodges Construction, Inc. is one of the most respected custom home builders in Arizona. Our high standards result in cutting-edge design and unparalleled workmanship that transcend the traditional. Hodges Construction, Inc. delivers quality and service all within budget. We focus on ensuring each client receives undivided attention and a caliber of customer service which is second to none. Every member of the Hodges Construction, Inc. team brings to each project a wealth of homebuilding and commercial design experience along with firm resolve to make each project exceed the customer’s expectations. We are a full-service general contracting organization offering a multitude of services beyond the norm. Hodges Construction, Inc. considers it a privilege to partner with homeowners for the purpose of home building or improvements. We believe a successful partnership includes respect, communication, quality workmanship and financial integrity. We take homeowner’s dreams seriously and are honored to be considered for your new home or home improvement. Our commercial construction division provides well-coordinated, on-time delivery of beautifully finished projects of new construction, remodeling, tenant improvements and code compliance needs. Our team approach results in cost-efficient projects displaying the finest in design concept, engineering and quality construction. Among the many completed commercial projects we have provided are: schools, office buildings, medical buildings and facilities, retail businesses, sports facilities and churches. We believe architecture is about integrating with nature and when done right can make living, working and playing more rewarding while also providing a lighter footprint on our planet. Every project, regardless of size or scale, is unique and emerges out of specific programmatic, budget and site opportunities that inform the design process. Our approach to each design is to balance the triple bottom line of economic, ecological and social variables as we strive to create architecture with the ability to positively transform communities and civic life. The result is buildings that are in tune with their surroundings and resonate with their users. We’re committed to providing you with the highest level of service, so you’ll always choose us for your remodeling needs.We know that remodeling upsets your life and is not fun or convenient. So, we want make the process as easy and enjoyable as possible for you. We genuinely care about your project and your experience, and it shows. We’re committed to remodeling and to serving you with quality and value. We'll come to you, listen to your needs and wants, and then come back to you with a logical, feasible plan that works for you. Our first-time customers continually become our long term customers time and time again, choosing us for all their remodeling needs. Call us today, and see what our commitment to quality is all about! We may not be related, but you’ll feel like we’re family. When you don’t have time to get things done around the house or it’s just time for a remodel, we can take care of almost anything. We do the “honey dos” so you don’t have to. Tad’s Home Repair and Remodelling provides a broad range of services. We do everything from changing light bulbs and replacing dripping faucets to refreshing tired landscaping and remodelling kitchens and baths from top to bottom. We are trained XCEL deck installers able to give tired pool decks and porches a new lease on life with treatments such as flagstone and brick without the large expense and tiresome maintenance. We can refresh your pool area with both large and small water features and rockscaping to create that oasis you’ve always wanted. Almost any task that you can dream up we can do. No job is too small. We often work with local realtors to provide the many repairs needed to prepare homes for sale or for rent.